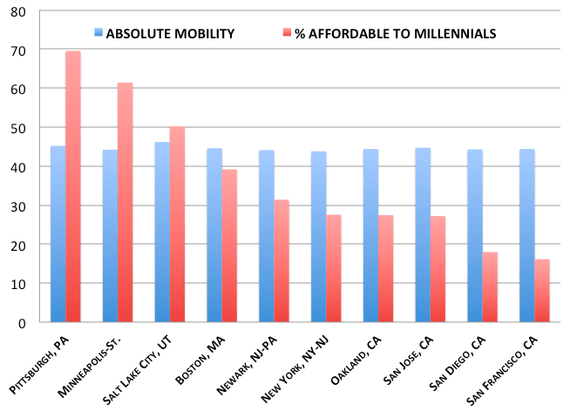 There are the only three cities in the United States with (a) at least 50 percent of houses affordable to middle-class Millennials and (b) a top-10 finish in Chetty’s mobility calculations. These are the outliers: Pittsburgh, Minneapolis, and Salt Lake City. I’m looking at buying a house. I’m in a pretty good position. There are just two things that really set up me up for success. First, I have an advanced degree in STEM. Second, I decided to stay in Minneapolis and not move back to Silicon Valley. I grew up in Cupertino. I would regularly bike past Apple headquarters back in the 1980s. I went to a good high school. I saw the improvements being made to the biggest roads through town. I saw some of my closest friends move into progressively larger and larger homes as their parents income ballooned. Then I left to go to college on the East Coast. After I graduated, I moved to get my PhD. But, I ended up in school in the middle of the country, in the fly-over state of Minnesota, where I finished my PhD and got married. And no one from Silicon Valley would ever believe that this was a good place to be. Why wouldn’t I move back to the bay area? There are so many jobs out there! But the numbers are racking up and Minneapolis is starting to look pretty great. Minneapolis has one of the highest collection of Fortune 500 companies per capita in the country. In 2014, Raj Chetty and others developed a system to determine how likely it was that you could move up the socioeconomic ladder based on location. While there are many way to move up in San Jose, CA, there are also viable options in Salt Lake City, Pittsburgh, Boston, Minneapolis and more. Results table from “Where is the Land of Opportunity? Now, getting paid more money is definitely a good thing. But improving your income without also measuring for cost of living is only showing half the story. As I’m looking for houses here in Minneapolis, one can buy a nice 3-4 bedroom home for 200-350k. In Cupertino, this is not the case. Here is a great example. You really only need to watch from 5:31-6:15, though the rest of the video is good too. The clip shows two examples of unlivable homes for more than a million dollars. The realtor in this video remarks that two highly successful techies who each make more than $200,000 may only secure a mortgage for a home costing up to 2 million and that may not be enough money to buy anything good. And the cost of housing in Silicon Valley is rising rapidly. With housing is rising so rapidly, it’s leading folks to ask if there is a Silicon Bubble at work here (Bubblelicious- Planet Money NPR). So, the Cupertino I knew has a very price tag associated with it. Many of my friends who live in silicon valley can’t even think about buying a house in that environment. So now let’s get back to the quote at the top of this article. Can we compare Minneapolis to Silicon Valley on the metric of upward mobility as well as housing affordability? This entry was posted in Communicating Math, Shopping and tagged Cupertino, housing, math, Millennials, Minneapolis, Minnesota, Silicon Valley, Twin Cities. Bookmark the permalink. 2 Responses to Silicon Valley Bubbles? Seriously though, the cost-of-living disparities across the country are just insane! Good luck in your decisions and future. Really interesting article, and great video link. As someone who will be moving in the other direction, this has me worried. Minneapolis is a great place to be!